How does the brain adapt to visual word? Slides from a talk I gave to students and colleagues at RIT/NTID in April 2018 about my work on the electrophysiological brain responses to printed words. 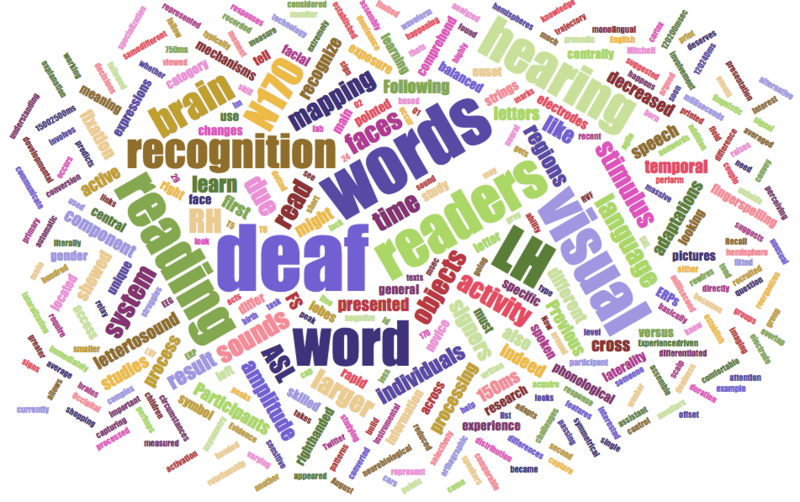 The key question we are trying to answer is whether the deaf brain adapts differently to reading printed words compared to the hearing brain because it has impoverished access to spoken language. This work is important for our understanding about the brain's plasticity following deafness and has implications for reading and literacy. What do sign languages reveal about human language? A lecture presented at UCLA to students of Linguistics. The aims of this talk were to raise questions about language universals and the nature of human language, highlight the importance of comparative research between signed and spoken languages, and to review some key concepts in sign language research. A sample presentation and practical activity I presented at the Linguistic Society of America Summer Institute, Lexington, KY, July 2017. The aim of the workshop was to provide information on resources useful for research on ASL, including (a) a new corpus of longitudinal data on the acquisition of ASL; (b) ASL-LEX and ASL SignBank lexical databases; and (c) upgrades to ELAN that bridge annotations with SignBank entries. This project was presented at the Theoretical Issues in Sign Language Research conference in Melbourne, Australia, 2016 and received an Early Career prize. The visualization of the ASL-LEX lexicon won the People's Choice award in the NSF Visualization Challenge competition (details here).